Jubilant mood: Ranjan. 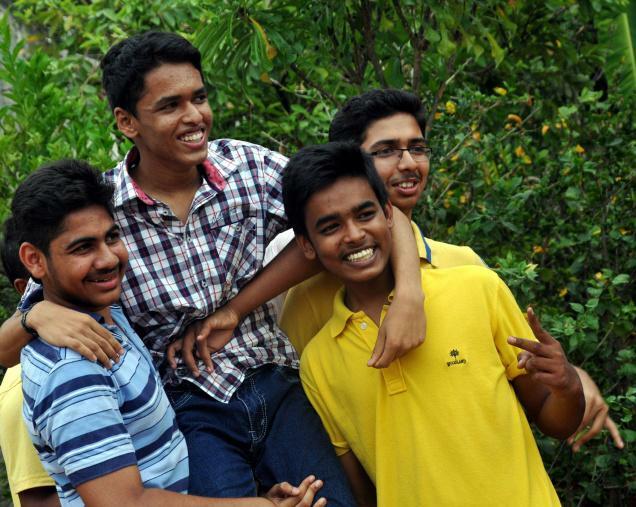 S. of Poorna Prajna School, Bhadravati, who scored top rank in SSLC examination, with his friends. Ranjan of Bhadravati sets a record by getting 625/625 in his school exam; wants to pursue medicine. It’s never been done before in Karnataka and he did it. B.S. Ranjan scored 625 out of 625 in the SSLC (Secondary School Leaving Certificate) examinations, results for which were announced on Monday. A huge cricket fan, Ranjan from Poornaprajna Education Centre in the small town of Bhadravati in Shivamogga district, says he was taken by surprise to hear about his top rank. “I was taking a nap after discussing with my friends about Monday’s IPL match between Kolkata Knight Riders and Royal Challengers Bangalore when my teacher rang me up and informed me about the result,” he said. He never went to tuitions, but studied six hours a day. “My teachers provided me valuable tips on managing the time,” he says. Since the results came, Ranjan has been receiving congratulatory messages from every corner. However, there is no harm in students who have problems in comprehending subjects going in for additional teaching sessions, he adds. His father B.S. Shankaranarayan is into tiles business and his mother Triveni is a home-maker. “My son has achieved what he has due to his own hard work. We have only facilitated his study,” said an elated father. The mother added that he woke up early every morning to study. Amare Gowda, Principal of Poornaprajna Education Centre, is elated. He said Ranjan was hardworking and studious. “The school is proud of his achievement,” he said. Right from his childhood, Ranjan has been dreaming of a career in medicine and the results have only made his dreams stronger. “The medical profession is a means to mitigate human pain and suffering. The dream to become a doctor motivated me to excel in studies,” says the small town boy who has dared to dream big.